Shopping for home goods, housewares or home décor ideas in the Grand Rapids area? Make your first stop the Bed Bath & Beyond® store near you – it’s just off I-96 at the 28th St SE exit. 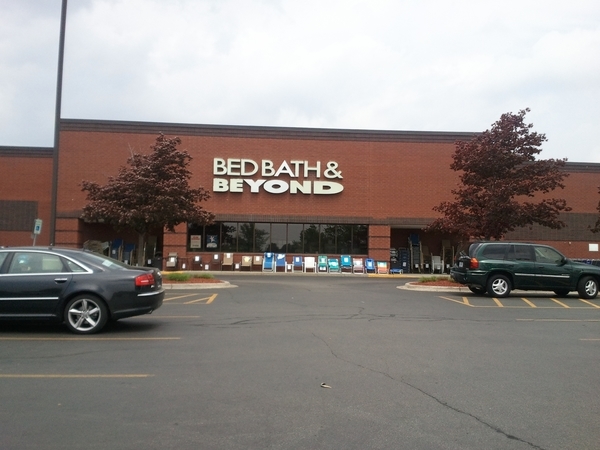 Enjoy shopping all the brands you love at the nearby Bed Bath & Beyond® located at 4901 28th Street Southeast, Grand Rapids, MI 49512; (616) 977-7110.
anniversary registry or special occasion registry. Planning a wedding? Experienced personal wedding consultants are ready to assist during store hours plus this location features a comprehensive fine china department. Visit the store any time to shop for storage and organization solutions, cleaning supplies, cookware, coffee makers and cutlery, bath towels and shower curtains, bedding basics such as sheets, comforters and duvet covers, home décor and accessories, rugs, curtains, pillows and accent furniture. In addition to seasonal décor and outdoor supplies, this location features a Harmon® Face Values® filled with discount cosmetics, health and beauty supplies.